This is as good as it gets! 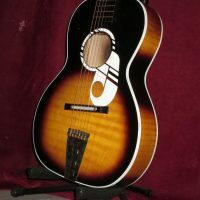 This 1966 K1160 Parlor Guitar is in beautiful condition. The neck is solid. There are no cracks, as well as no repairs. After I got it, I replaced the strings and gave it a set up. I can’t believe how well this baby plays. I have played many of these Kay guitars over the years, and this is one of the best. The intonation is right on and the string height is great all along the neck. You don’t want to let this one get away!